Mix yolks and sugar together. Pre-heat Silex to 240°. Place cream and vanilla pod in the Silex baking dish and bring to the boil. Remove the pod and scrap its insides into the cream. Now mix the cream into the yolks and sugar. Transfer back into the baking dish and cook until the moisture coats the back of the spoon. Be careful not to curdle the mixture. Divide the mixture into ramekins or moulds. Sit these in the Silex baking dish and add warm water until it comes threequarters up the sides of the ramekins. Cook in the pre-heated Silex (turn down to 180°) for 6-8 minutes. Remove from the Silex and allow to cool. To finish the brulées, sprinkle them liberally with caster sugar. If you have a blowtorch, use that to brown the sugar. If not, brown the sugar in pre-heated Silex grill, having the ramekins as close as possible to the heat. 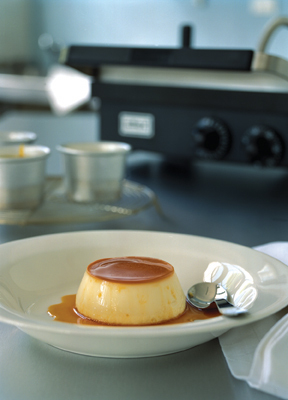 The top should be hard and when cracked with the spoon will give a wonderful contrast to the creamy bottom. Posted by Piotis . on June 12, 2014 in News.